It is no big secret that I love Christmas. 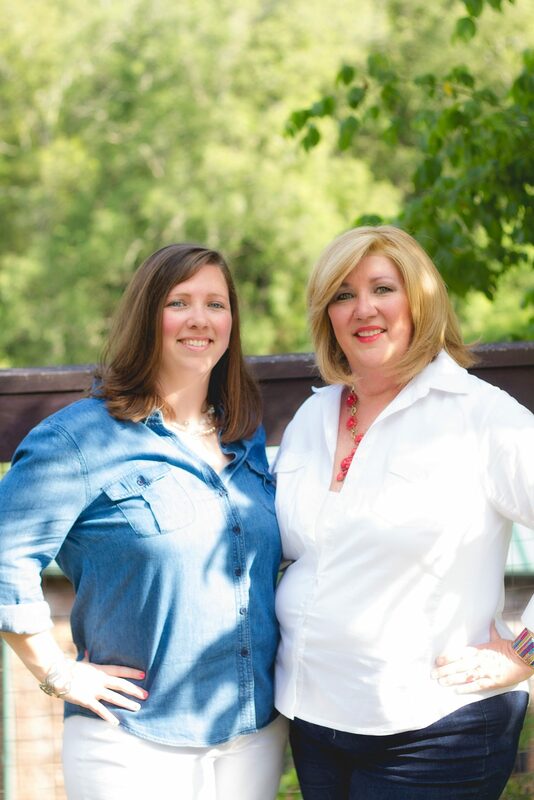 There are parties to attend, cookies to bake (and eat), family and friends to spend time with and rooms to decorate. Just last night we attended an annual event in Jennifer’s historic neighborhood. It is a candlelight tour of homes and we were not disappointed…gorgeous Victorian homes decked out with lots of lights and decorations. We look forward to the tour every single year. My home is small in size but I maximized the areas that I have to usher in my favorite time of year. 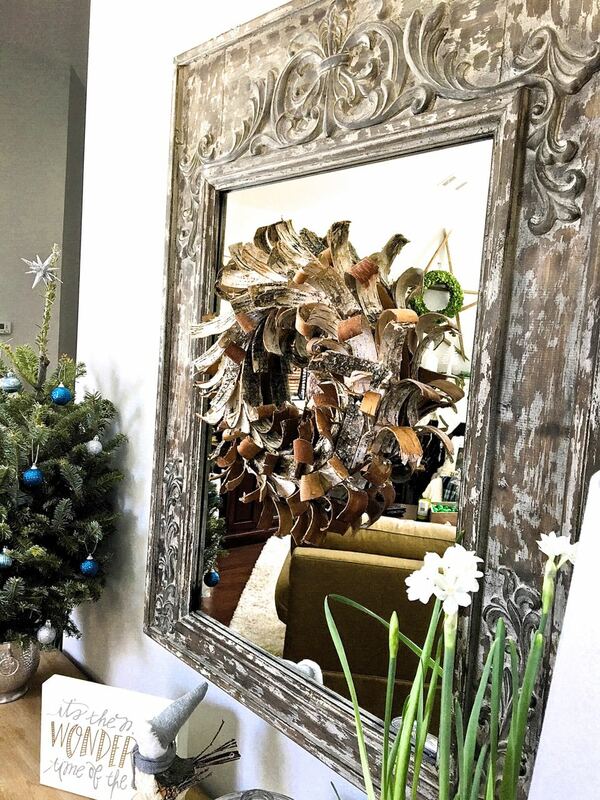 Our Christmas entryway decor is the first thing guests see when they walk in the front door. As you can see, this isn’t a big area. I added this narrow table and began layering things I had on hand or procured as inexpensively as possible. 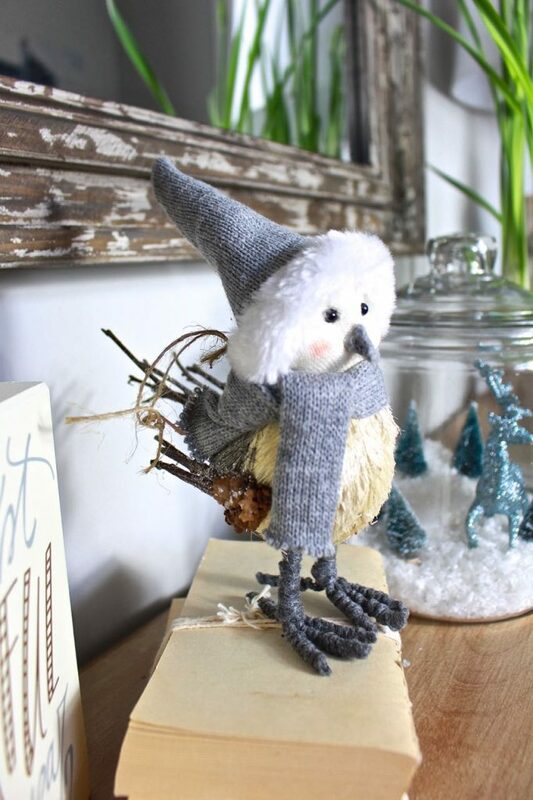 How adorable is this Winter bird? 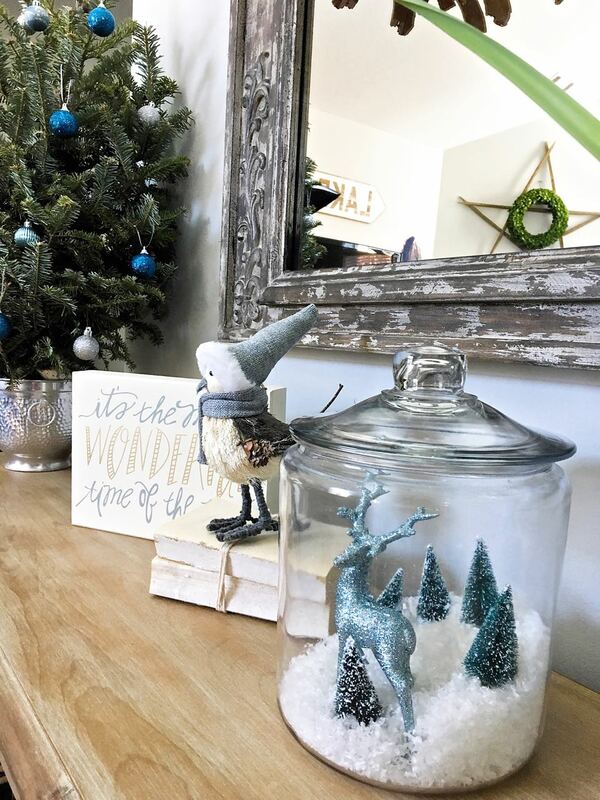 Snow globe terrariums are so fun and easy to put together. I stole borrowed some snow from Jenn’s stash for this display. 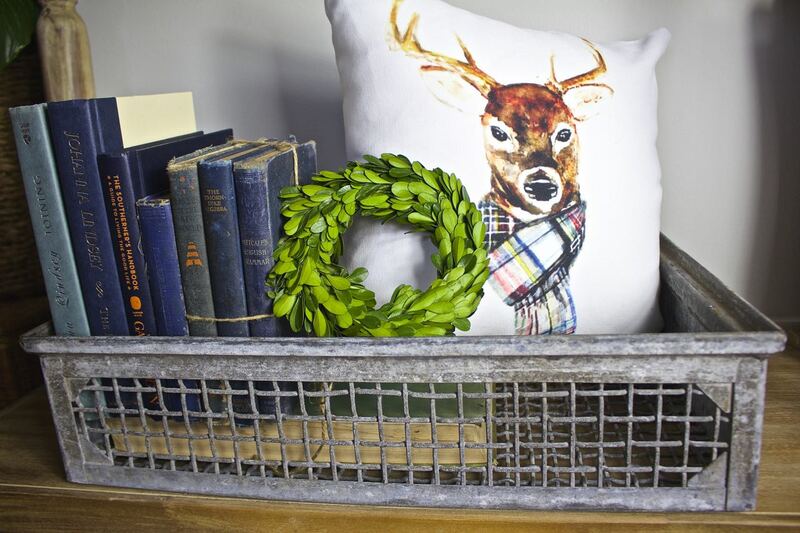 The deer and mini trees are dollar store purchases. 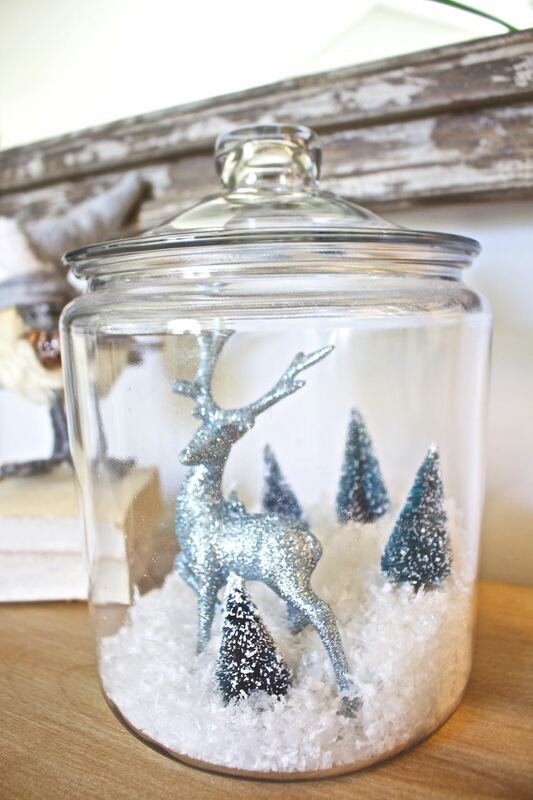 You can see other snow globe displays that we have made HERE and HERE. They literally take just seconds to put together. 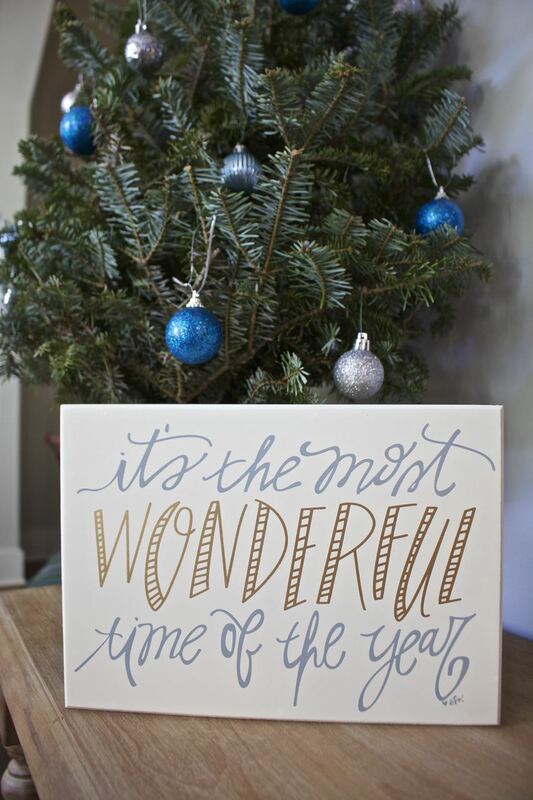 This is one of our favorite holiday sentiments. 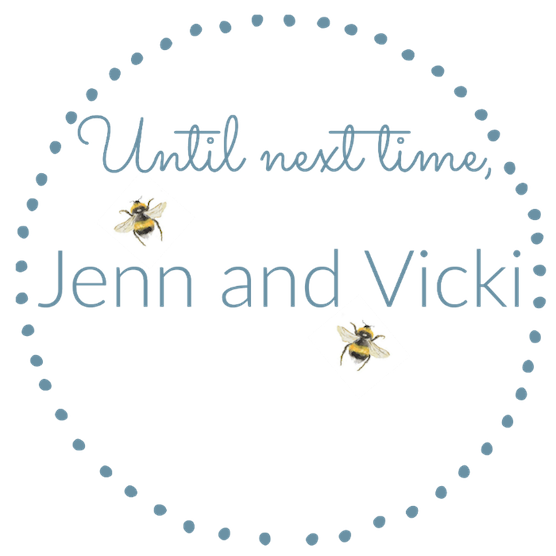 Our craft store had a fabulous collection of these cute signs – I couldn’t pass this up at 50% for just $5.00. 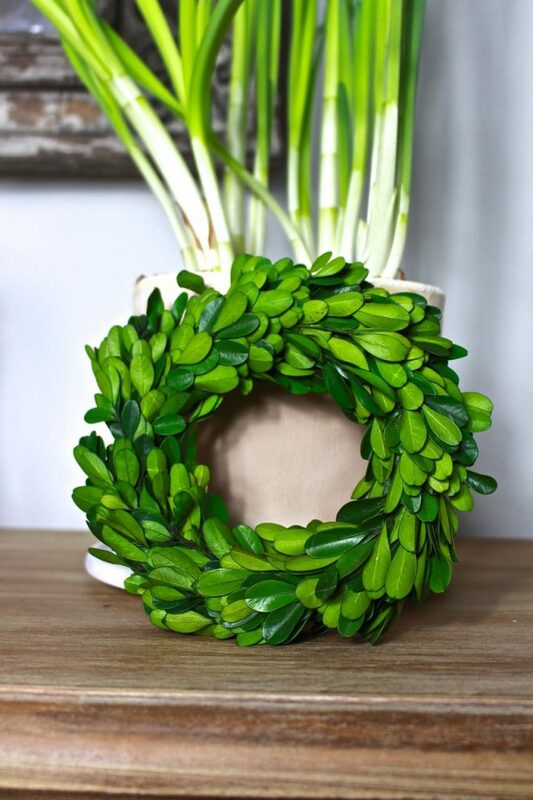 Fresh greenery is key for me in my Christmas decor. 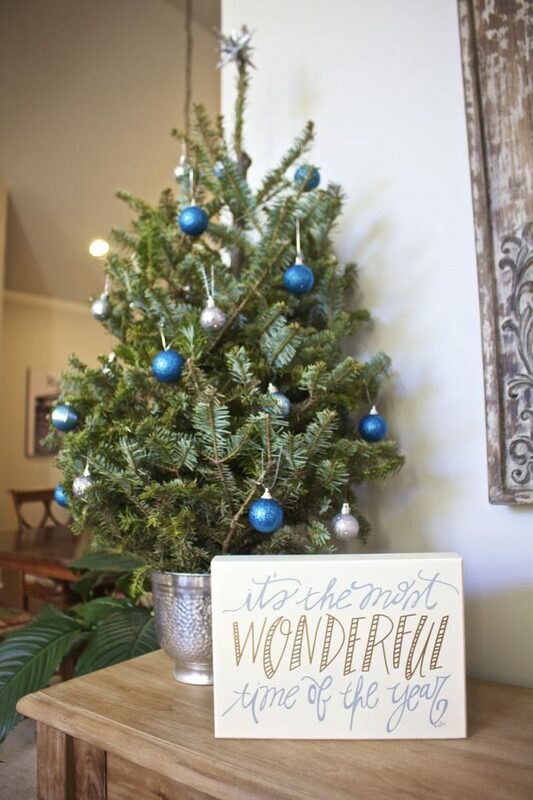 The little tabletop tree was just $10 and fills the house with a woodsy pine fragrance. When I bought the tree I wasn’t sure how I was going to display it. 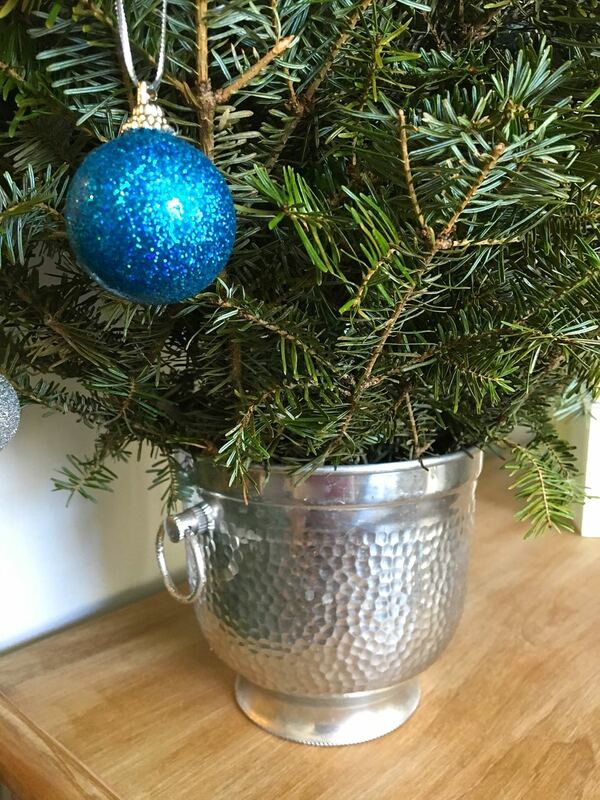 I found this vintage hammered aluminum ice bucket at the thrift store for .93 cents! 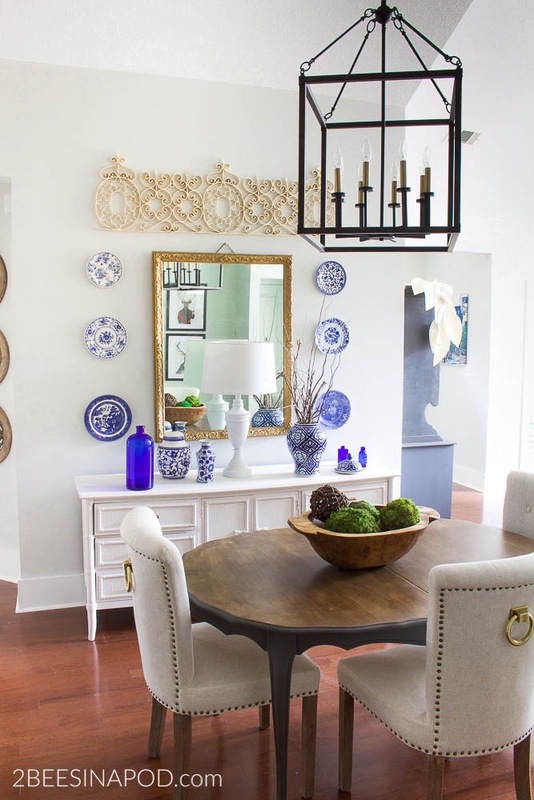 It works perfectly for the entryway table. 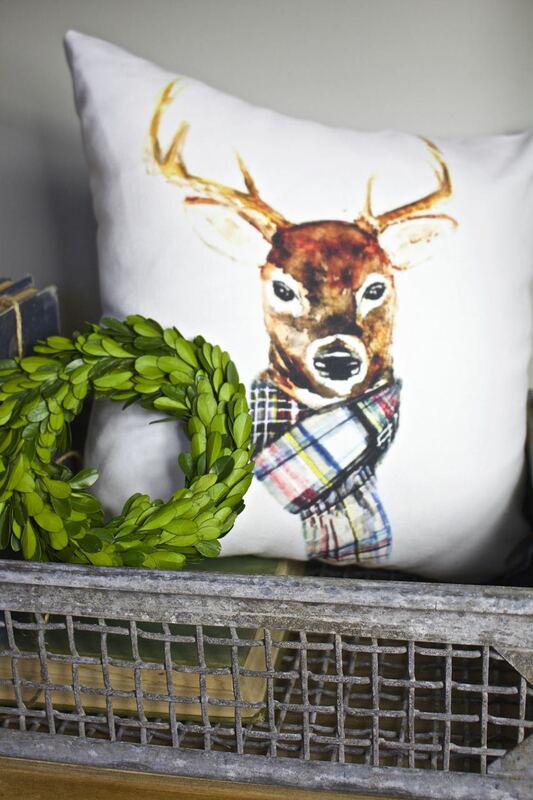 I’ve had the deer pillow cover for a couple of years now. 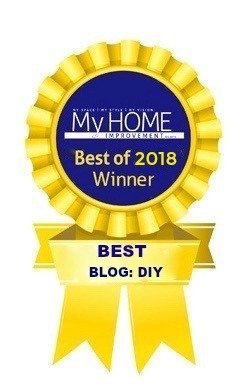 Again – I’m not quite sure how it made it to this house with our move, but I am super grateful that it did. 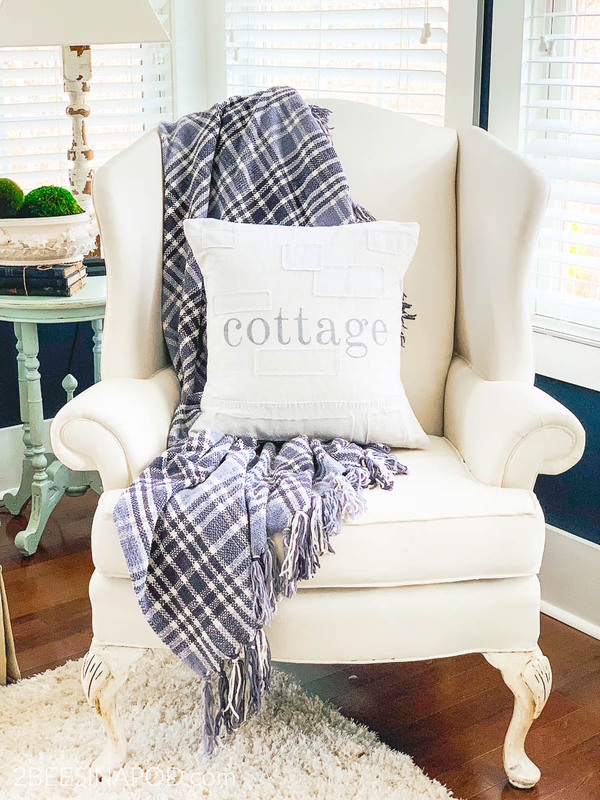 Several months ago I had the privilege of attending a Joanna Gaines event. While there I bought this vintage galvanized basket. The shop had it marked as an egg basket – I would love to know your thoughts on this. 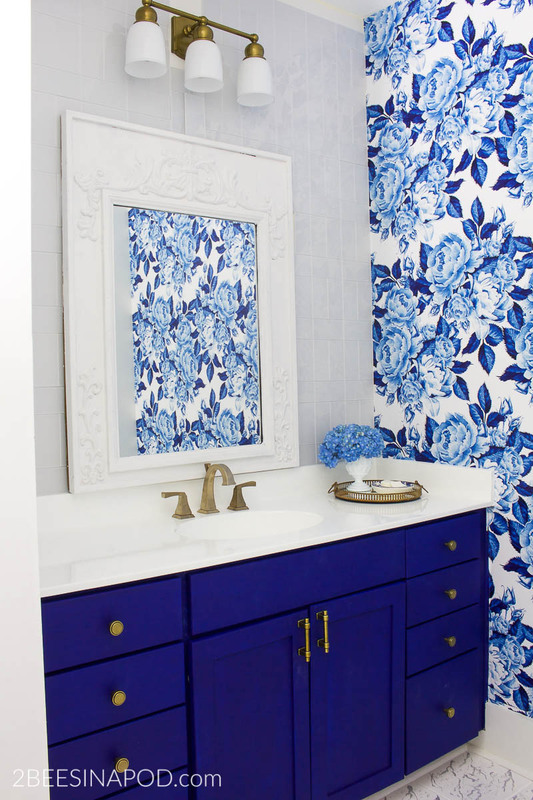 Whatever it is, it makes for the perfect place to display vignettes. 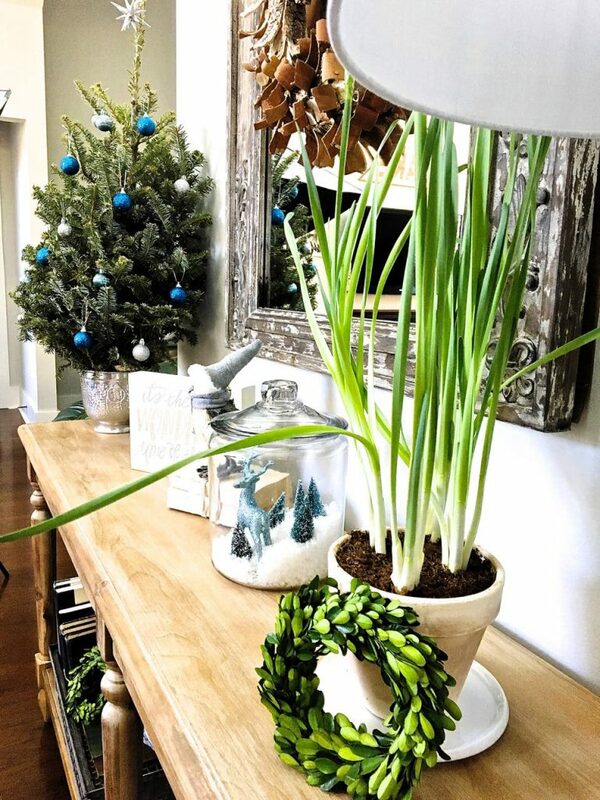 Paperwhite bulbs signify the holidays for me. 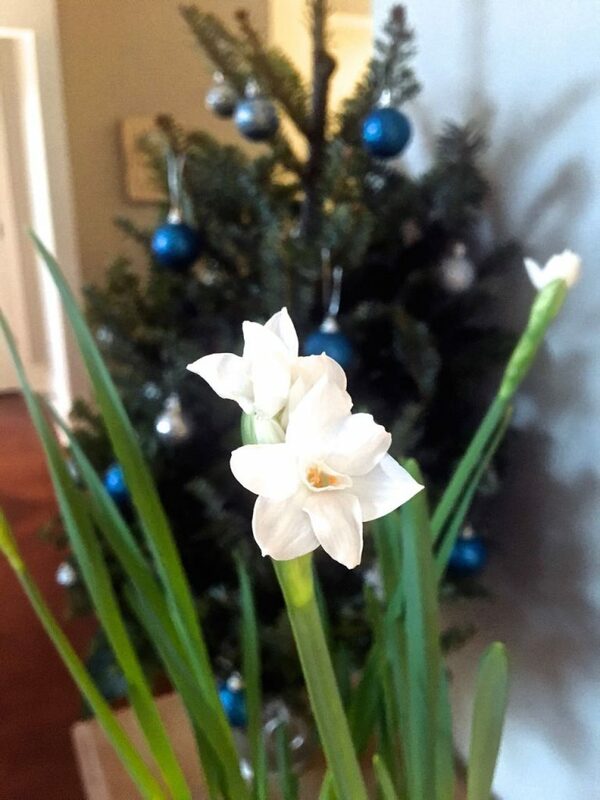 I force bulbs every year – the delicate flowers are so pretty and fragrant. You can see how I grow them HERE. It’s a Wonderful Life is our family’s all-time favorite Christmas movie. Traditionally this is viewed each and every Christmas Eve, without fail. 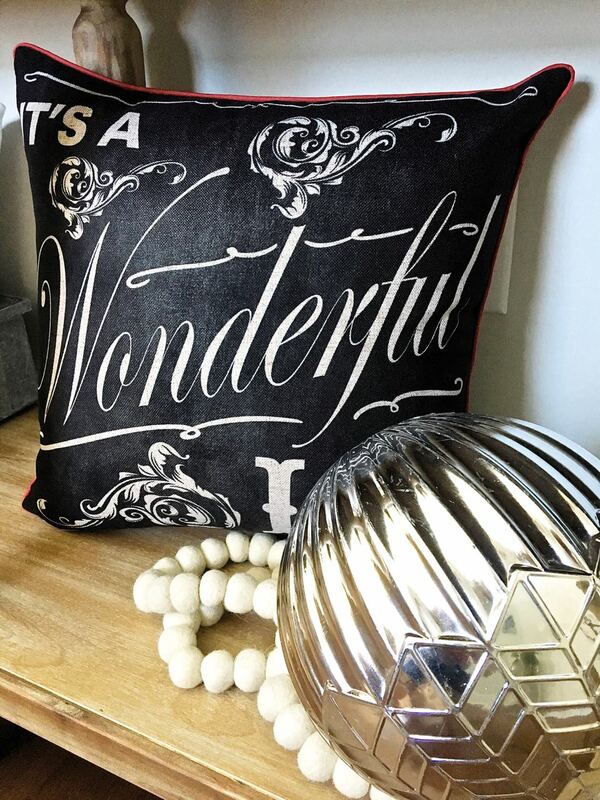 I was thrilled to find this chalkboard pillow cover online for just $5.00! Remember how I told you last week that the Dollar Spot at Target is my friend? 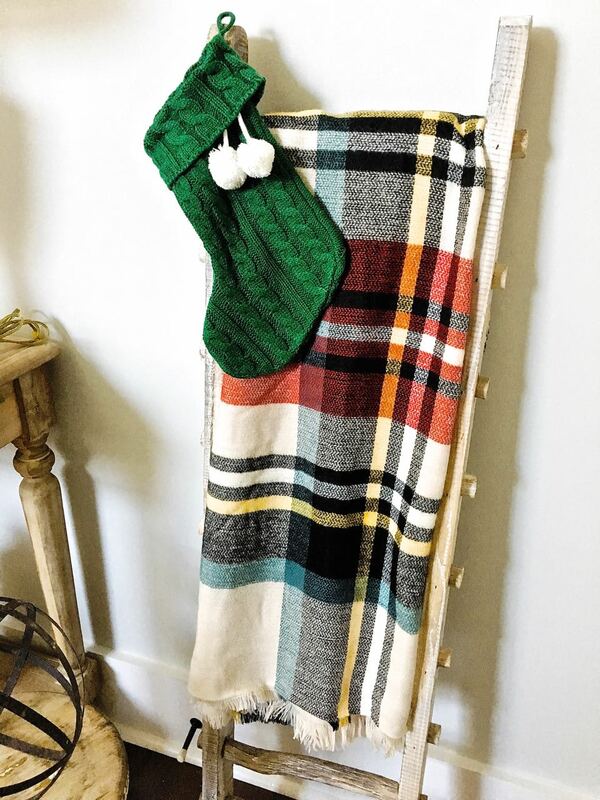 This is where I found the plaid scarf and the green sweater stocking. They look great displayed on my ladder. This is our first Christmas spent in this house. 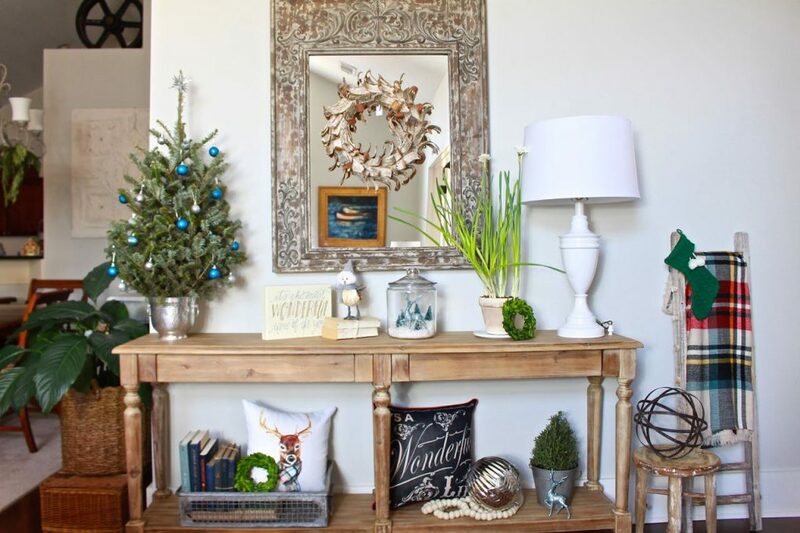 The Christmas entryway decor is a perfect welcoming greeting for visiting family and friends. Now, if I could just get my Christmas shopping done! How about you? Is all of your decorating and shopping complete? I hope to finish everything this week. Wish me luck! 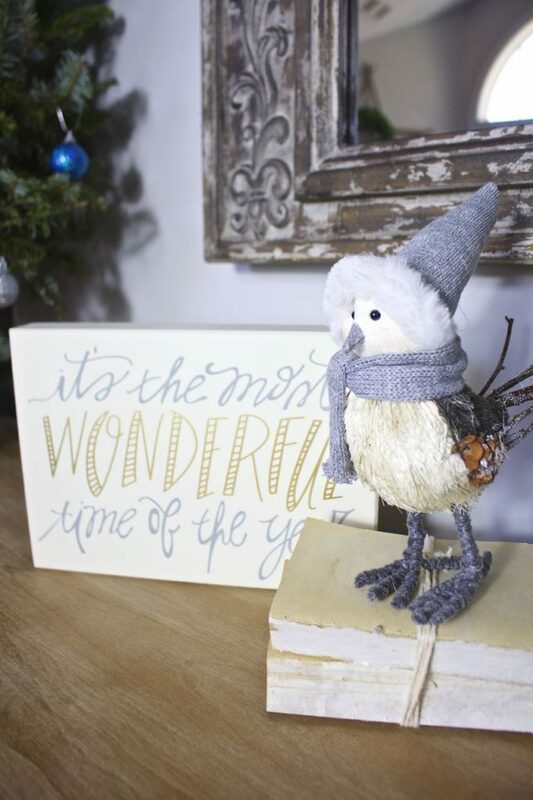 I love the blend of colors; and the Christmas birdie is so cute!